Medical device maker Stryker paid $2 billion to settle lawsuits over two models of its hip implants in 2014. In November 2014, the company agreed to yet another settlement over its LFIT V40 Femoral Head component. Court documents show that people from across the country experienced similar complications from several types of Stryker hip replacements. At least six models of Stryker hip implants or their components have been named in lawsuits. Three brands — Rejuvenate, ABG II, and LFIT Anatomic CoCr V40 femoral heads — have been included in multidistrict litigations (MDLs). People who sued Stryker claimed faulty hip implants caused severe pain and other complications that required additional surgery to repair. The lawsuits claimed metal parts in the implants released toxic metal ions into the body. One man filed a lawsuit after he required revision surgery less than two years after receiving a Stryker hip replacement. Branko Obradovic told the Palm Beach Post that he couldn’t sit for long periods of time and getting out of a car was an ordeal. Mern Direnzo received the Accolade TMZF and LFIT Anatomic V40 Femoral Head in October 2009. Following the hip replacement, blood tests showed high levels of metal ions in her blood and urine. She underwent a revision surgery to remove the device. Direnzo filed a lawsuit in 2014. “[Stryker] failed to adequately design and manufacture the device to insure that it would not fret, corrode, erode, deteriorate and induce severe metal toxicity in patients,” Direnzo’s attorneys wrote in her complaint. Hundreds of others have filed lawsuits over Stryker’s LFIT V40 femoral head hip components. Stryker recalled 42,519 LFIT V40 components in 2016, citing “higher than expected” complication rates. Both sides announced an initial settlement agreement on November 2, 2018. At the time, there were about 457 lawsuits pending in the multidistrict litigation (MDL) in a Minnesota federal court. The first trial was not expected until late 2019. Federal court documents showed the agreement would also include another 100 lawsuits combined in a New Jersey state court. Those cases were part of a multicounty litigation (MCL). Terms of the settlement were confidential as both sides finalized an agreement. In April 2012, Stryker recalled nearly 44,000 Rejuvenate and 9,000 ABG II implants. The company sent out an Urgent Field Safety Notice that warned “fretting and/or corrosion” could lead to “metallosis, necrosis, and/or pain” for people implanted with the devices. That same year patients, such as Tracy Sponer of North Little Rock, Arkansas, began suing Stryker. Sponer had a Rejuvenate hip implanted on Sept. 6, 2011. A year later, she was forced to have revision surgery after the hip failed. In her lawsuit, Sponer claimed the failure and revision surgery caused her ongoing mental and physical pain. Her complaint accused Stryker of “flagrant disregard for human life” and asked the court to award punitive damages to punish the company. In 2014, Stryker agreed to pay $1.43 billion to settle thousands of cases. It extended the settlement to more patients in 2016, raising the total settlement amount to somewhere between $2 billion and $2.2 billion. The average amount paid for each problematic hip implant was $600,000. Under the settlement, the deadline to file a lawsuit over those hip replacements was March 2017. Stryker expected all settlement payments to be delivered by the end of 2017. As of April 2019, there were still 1,226 lawsuits pending in a Minnesota federal court as part of the Rejuvenate and ABG II multidistrict litigation. Almost 800 cases over ABG II hip replacements were also still pending in a New Jersey multicounty litigation in May 2018. 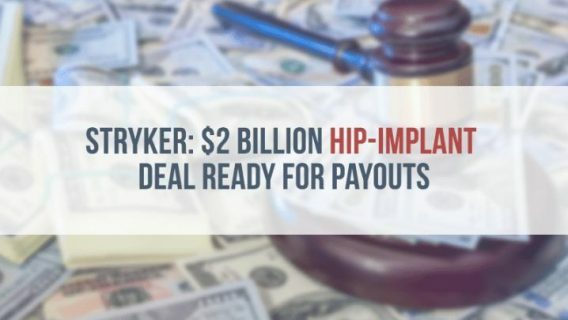 Stryker issued a market withdrawal of all Rejuvenate and ABG II hip implants worldwide after the company alerted doctors to potential health complications of the hips. The first lawsuit was filed in New Jersey state courts. U.S. Judicial Panel on Multidistrict Litigation combined federal lawsuits into Minnesota federal court. The first trial was canceled as Stryker offered to settle. The company offered a $1.4 billion settlement. The time period to apply for the settlement ended; Stryker promised to have all settlement payments sent out by end of year. There were 1,226 lawsuits still pending in federal court in Minnesota.